MOLLUSCA : CEPHALASPIDEA : Diaphanidae SNAILS, SLUGS, ETC. 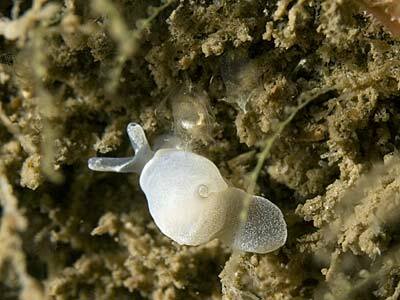 Description: A tiny sea slug with an internal shell. The shell is covered by the mantle and there are two prominent head tentacles. The tentacles, tail and mantle are coloured with powdery white pigment. Habitat: Rocky reefs in strong or moderate tidal streams. Ecology: The food of Colpodaspis species is reported as unknown in the literature. Recent observations in Northern Ireland suggest that it feeds on a sea squirt, the pinhead squirt, Pycnoclavella stolonialis. Distribution: Rarely found except by divers, originally described from Norway. Recent finds of living animals from western coasts of Britain and Ireland and from the western Mediterranean. Picton, B.E. & Morrow, C.C. (2016). Colpodaspis pusilla M Sars, 1870. [In] Encyclopedia of Marine Life of Britain and Ireland.